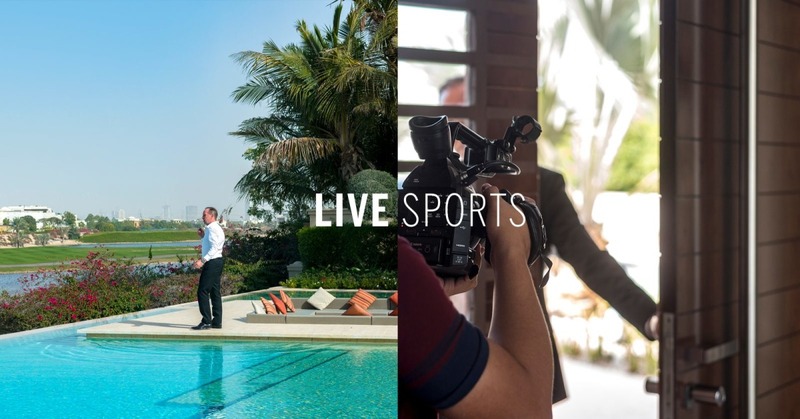 The biggest football tournament of the year, FIFA World Cup 2018 begins tomorrow (14th June) in Russia and with that in mind we take you back behind-the-scenes of our LIVE Sports video that featured a football legend, Trevor Stevens. As Trevor visited the Serene Family Home in Emirates Hills last month and looked over the Montgomerie Golf Course, he reflected on the spirit of sportsmanship, from playing for his school team to representing England in two World Cups. The whole world awaits in excitement for the next FIFA World Cup, which includes football’s biggest names that are all prepared to score a victory for their home country. We have once again met with Trevor to find out his favorite World Cup teams in addition to his experiences and memories from the time when he himself played in the World Cup. This year’s FIFA World Cup is taking place in Russia and will involve 32 national teams that have won the qualifying competitions as well as the automatically qualified national team of Russia. We can look forward to 64 matches that will be played in 12 venues in 11 cities with the the final match taking place on 15th July at the Luzhniki Stadium in Moscow. The first match that will begin the tournament will be between the teams of Russia and Saudi Arabia on 14th June, followed by Egypt Uruguay. Q. Who are your favorite teams playing in the World Cup 2018? A. One of them is definitely Brazil, I have been watching them play and they are one of the most complete and exciting teams to watch. Neymar is fit and strong, but, of course in a tournament like the World Cup it is not only about the strength it is also about preparation. If they can get that right, I wouldn’t be surprised if they won. Q. What do you look forward to the most? A. Well, of course because I am English I am looking forward to see the England team the most. We have a team of young and confident players, but as I have played in two World Cups myself, the first one in 1986 and the second one in 1990 and so I know the kind of pressure they will need to cope with. When the whistle goes off and you are on the pitch, the energy and pressure builds up and I am curious to see how this will effect them because that is the main challenge. Q. Are there gonna be a lot of goals? Who do you think will score the most? A. Yes, I think there will be a plenty of goals, they are many strong teams and I don’t think they are particularly defensive. To name a few France, Argentina, Spain, Brazil and also Belgium these are the traditionally exciting teams to watch. Players like Romelu Lukaku and Harry Kane will have the people sitting on the edge of their seats. I expect there to be a lot of excitement and goals. While, most people might be excited about the Olympics that come every four years, like the World Cup I think the World Cup is just as important. Being a former professional footballer I know the kind of energy it creates globally and how it affects the players, it’s an incredible feeling for both the players and the viewers. Q. Will the European teams be successful? A. Even though the World Cup is happening in Russia this year, which appears to be an advantage for the European teams I would not say it will have a significant effect because the South American players also play in Europe a lot, it is not something new for them. Q. Will they be using VAR? A. Yes, they will, however I am not a huge fan of it because I think it has not been tested and perfected enough yet and it is too early to use it in the World Cup. It will be interesting to see how it will effect the game as a whole. One thing that should be pointed out is that the people watching the TV will be more informed and therefore have a bigger advantage and knowledge of the game, over the people that are actually sitting on the stadium because of this, and that is not how it should be. Q. Are you going to Russia? A. No, but I have been to many and the atmosphere as a whole is just incredible. From the carnivals, festivals to the actual games. It brings people together as one big football family, in which all cultural differences are forgotten, you make new friends and it is a overall a huge mix of strong emotions from excitement to disappointment. Q. Which balls are they going to be using? A. The supplier for the ball of the World Cup has been Adidas for as long as I can remember and this year will be no different. Q. Can you share some exciting moments with us from the time when you played in the World Cups? A. Yes, there are two moments that until now really stand out. The first one was when we played against Argentina in 1986 in Mexico City and Diego Maradona punched the ball into the goal and the referee did not see it, famously known as the “Hand of God” and one of the most famous goals in the entire football history. My team suffered as a consequence and lost that match. The second moment that stands out to me the most was also during the World Cup in 1990 when we played against West Germany and it got to the point where penalty kicks would decide whether or not we will progress to the finals. I was in a strange position because if Chris Waddle scored I would be the next player to go on. Of course, I wanted him to score and wanted that kind of fame, but on the other hand it would be a huge responsibility and pressure, I will never forget that feeling. What is new at Play On? We are also planning to launch a fans social platform website to connect the fans around the world directly with our sporting ambassadors. This will be done within 3-4 months. As always everyone will have their own favorite team or a player, but this year the opinions among people seem to be divided more then ever. There are so many exciting teams to look out for and realistically there are like 6-7 teams that have a chance to win the World Cup.